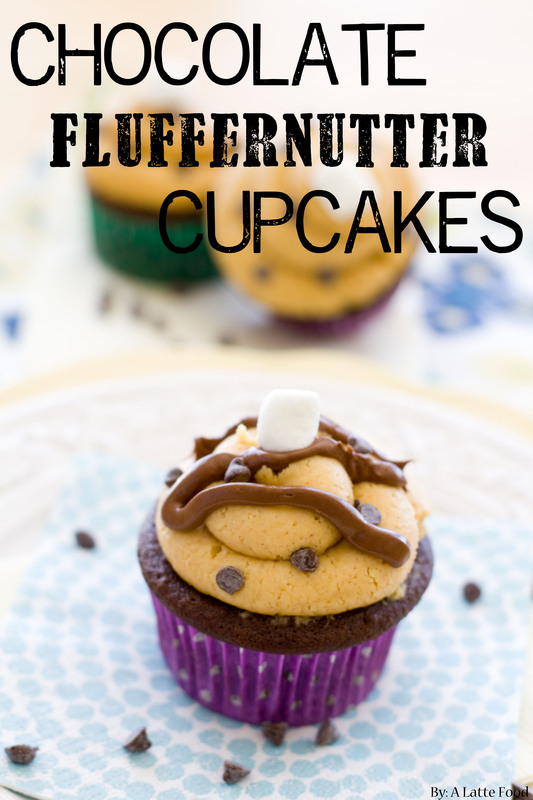 These Chocolate Fluffernutter Cupcakes begin with a milk chocolate cupcake base, are stuffed with marshmallows, and are topped with sweet homemade peanut butter frosting! The choc-o-holic’s must have dessert! Warning: this dessert is for chocolate peanut butter fanatics. And, I make no guarantees you won’t become a cupcake addict, like me. Hi, my name is Michelle and I have an obsession with all things cupcakes (cue these Funfetti Vanilla Cupcakes and these Lemon Raspberry Cupcakes). Like, if you can’t find me, you should probably send the search party to the nearest cupcake shop. Anyway, if you’re like me and think chocolate cupcakes reign supreme, I would wager a prettyyyyy hefty bet that you will be a fan of these Chocolate Fluffernutter Cupcakes. Have you ever tried those Reeses Fast Break candy bars? These cupcakes are very similar as they embody chocolate, peanut butter, and marshmallows just like those delicious candy bars. In my opinion, these are better though, because it’s in cupcake form. And for some reason, cupcakes make me smile. I think I just love the fact so many flavors can be packed into one compact dessert. It’s genius. Pure brilliance, I tell you. And these will satisfy any chocolate craving since they are heavy on the chocolate flavor and complemented with the peanut butter frosting, which tastes like a buckeye truffle. The moral of the story? These are GOOD. This is a fairly basic chocolate cupcake recipe, but it purposefully has more of a milk chocolate flavor than my other chocolate cupcake recipes. The peanut butter frosting complements the chocolate cake extremely well, and is super simple to make! For pictures, I decided to get fancy and drizzle some chocolate over the frosting (yes, it does look like a child did it) and top it with a marshmallow! Clearly, considering my lack of hand steadiness, I should’ve just left well enough alone. So, it’s up to you whether you want to add the toppings or not! In a mixer, cream butter until light and fluffy. In the microwave or in a double broiler, melt the 3 oz of chocolate until smooth. Sprinkle in the espresso powder and add to the butter; mix until combined. In a smaller bowl, combine eggs, brown sugar, and vanilla extract. Once mixed, add to the butter/chocolate mixture and mix together. In a large bowl, sift the flour, cocoa powder, baking powder, baking soda, and salt together. Lastly, in small bowl, combine the heavy cream, greek yogurt, and coffee. Alternately, add the flour and milk mixture to the butter mixture. Stir until just combined. Divide into 12 muffin cups, and bake for 18-22 minutes or until a cake tester comes out clean. Beat butter and peanut butter until light and fluffy. Add in vanilla and salt. Beat together. A cup at a time, slowly add in powdered sugar. I used about 2 1/4 cups, but use as little or as much as you want to reach your desired frosting taste/consistency. Similarly, add in heavy cream a Tbsp at a time until your frosting has reached your desired consistency (the heavy cream gives the frosting a smooth finish, and the more you beat the frosting with the heavy cream, the fluffier the frosting is). With a knife, cut a small hole in the center of each cupcake, about a 1/4 of the way down into the cupcake. Place 3-4 marshmallows inside. Cover with frosting (a great way to use the extra cake is to make cake balls). For the drizzle, melt the chocolate until it is smooth. In a plastic bag with the tip cut off (a makeshift piping bag) drizzle the chocolate over the frosting.